Vanessa: Touch me with your finger, softly. My scent on your neck. Open your lips. Taste. Caliban: I learned to stay in the shadows. To protect such a heart as this you gave me. Sembene: I believe in everything. Vanessa: I think, Mr. Gray, there are... tremors around us. Like the vibrations of a note of music. Hidden music. Some might be more attuned to them than others. What do those people do, those who have been chosen? Vanessa: To be alien. To be disenfranchised from those around you, is that not a dreadful curse? Dorian: To be different, to be powerful... is that not a divine gift? Dorian: You have exceptional composure. Dorian: Yes. What if you were to abandon this? 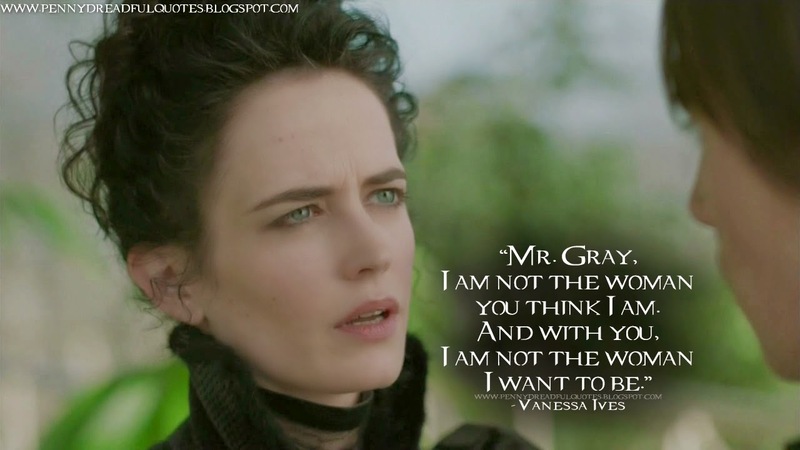 Vanessa: There are things within our soul that can never be unleashed. Dorian: What would happen if they were? Vanessa: They would consume us, we would cease to be and another would exist in our place, without control. Without limits. Vanessa: Don't ask permission. If you want to do a thing, do it because it is your desire, not my allowance. You must risk rejection. Victor: I believe in a place between Heaven and Hell. Between the living and the dead. A glorious place of everlasting rebirth, perhaps even salvation. Do you believe in such a place? Well, there is a price to pay for such a passage. As there is with all things. I know that you'll pay it easily.